Will Flavor Cupcakery “Win” the Crusaders Vote? 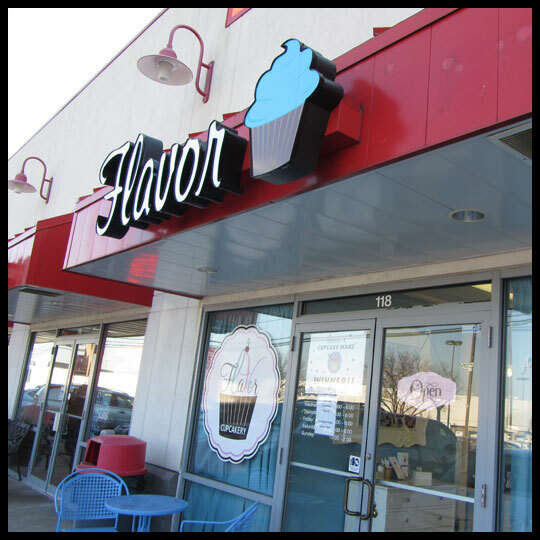 Several months ago, prior to their appearance (and win) on Cupcake Wars, a couple of friends told the Crusaders about Flavor Cupcakery, located north of Baltimore City in Bel Air, Maryland. We were unable to make it to their storefront location before the show aired, but after their success, we knew we had to check them out. So, last Saturday, Crusader Elisa, some good friends and I met for brunch followed by cupcakes at Flavor. The day was warm for January and brunch was great, it was a perfect way to start the day! 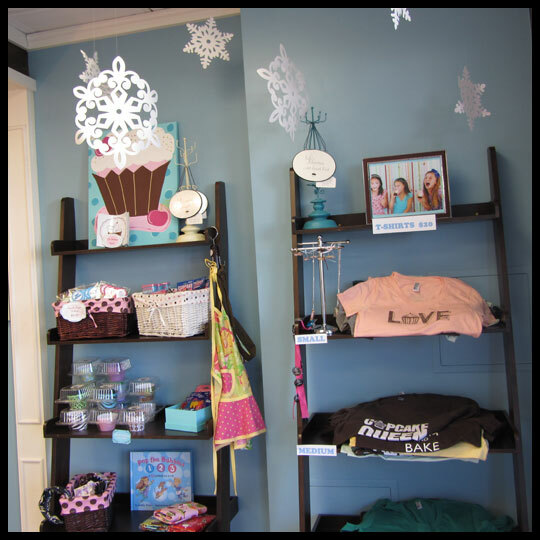 When we arrived at Flavor there were a few customers ahead of us, which was great as we could shop the fun merchandise and make our cupcake selections. The staff were amazingly friendly. Patient, full of smiles and willing to answer all our questions. They couldn’t have been a better fit in the adorable cupcake shop. We all decided to have a cupcake there and then take a bunch home. They didn’t have any seating inside, but they did have a small table and a bench outside. Since the weather was so beautiful, we took the chance to enjoy it. I decided that I would have the Cupcake Wars flavor, Modern Fruit Cake, first. I was so intrigued by this flavor and didn’t know what to expect. 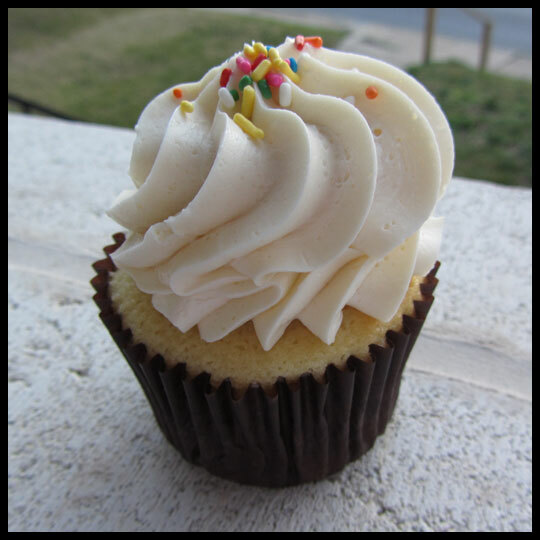 The rum vanilla bean frosting was not too sweet and very creamy, like butter. The five spice vanilla cake was very dense, but still moist and had a great flavor which the spices really came through. While the frosting and cake already formed a great cupcake, the filling is really what made it stand out. The filling was full of raisins, cherries and walnuts and had a great gooey texture. 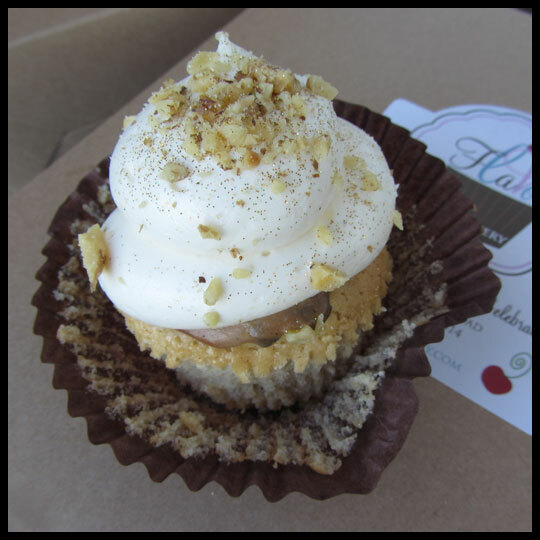 Overall this cupcake had so many different levels of textures and flavors that all worked cohesively. It was the only Cupcake Wars cupcake they had that day, but I would love to see what their other ones taste like. It’s amazing to me that this cupcake was thought up in minutes, not weeks. While we were there, Elisa decided to have the Snickerdoodle one she bought. So far, we were two for two! 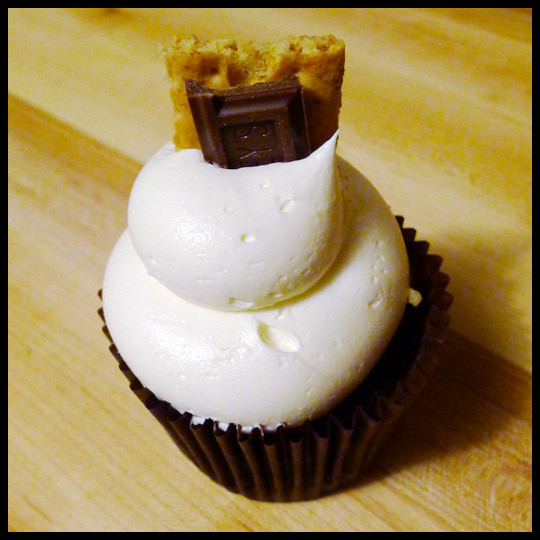 Our two friends decided to eat the S’mores cupcake they selected. It consisted of a graham cracker pie crust, chocolate cake, and a marshmallow frosting. All in all, we left there very happy and with many cupcakes to indulge in later. I also left with a dozen cake truffles since my husband and I were having company over that night. But I’ll post more on those later. For now, we’ll get back to the cupcakes. Crusader Jenn was coming to my house the next day and really wanted to try these cupcakes too, so I saved the remaining five (of my initial half a dozen) so we could enjoy together. We started with the Peanut Butter Chocolate. The dome of peanut butter frosting really had us excited. It was a little less “frosting-like” and a little more peanut buttery, but still was a very satisfying peanut butter mixture. Unfortunately the chocolate cake was crumbly and dry. We were super bummed about this and hesitant to move on to the next cupcake, a Double Chocolate cupcake with chocolate cake and dark chocolate frosting. As we suspected, the cake was also dry and crumbly, but the frosting was amazing! 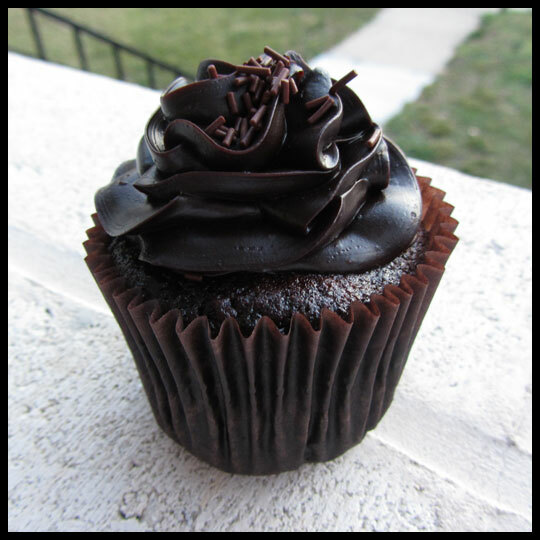 I’m a big fan of dark chocolate and this frosting hit the mark. If the cake had been more rich and moist this cupcake would have been a big winner. 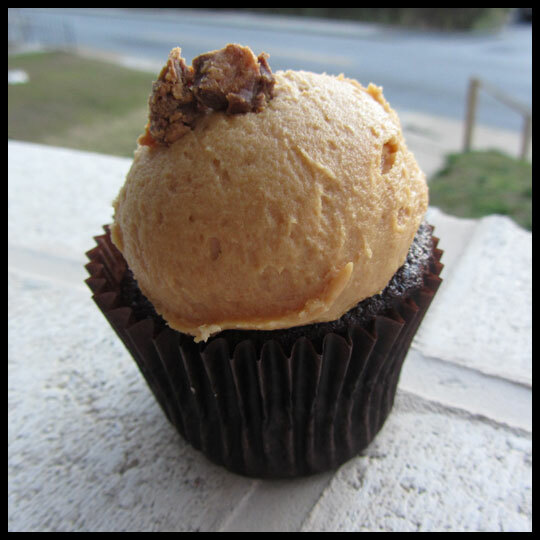 We still had 3 cupcakes to go, so we decided to go with the last cupcake that contained chocolate cake: The Salted Caramel. Surprisingly, the cake wasn’t dry and the smooth salted caramel frosting was UNBELIEVABLE! This is easily the best salted caramel frosting I’ve ever tasted. It was just the right blend of sweet and savory. The saltiness didn’t over power the caramel and likewise, the caramel didn’t overpower the saltiness. It was a perfect combination. I was so glad I decided to get this one! With only two left to go, I decided to give the Vanilla a try. If you’ve been reading recently, you’ll know that lately I’ve been really into Vanilla. 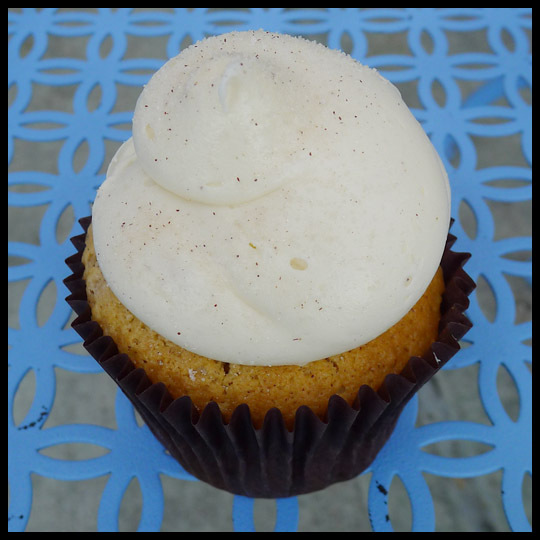 I used to think it was boring, but I’ve had some cupcakes that had great vanilla flavor and have decided that, when done correctly, it’s a tasty classic. Unfortunately this Vanilla didn’t do it for me. The cake was moist and the frosting was creamy, but it lacked the punch of vanilla flavor that I was looking for. So, not a total disappointment, just not the best I’ve had. 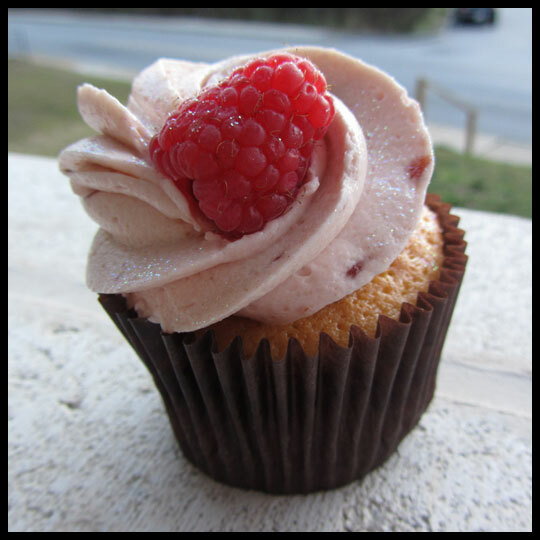 With that, it was time for the last cupcake, the Mixed Berry one. This cupcake is vanilla cake, with a raspberry filling and a strawberry frosting. 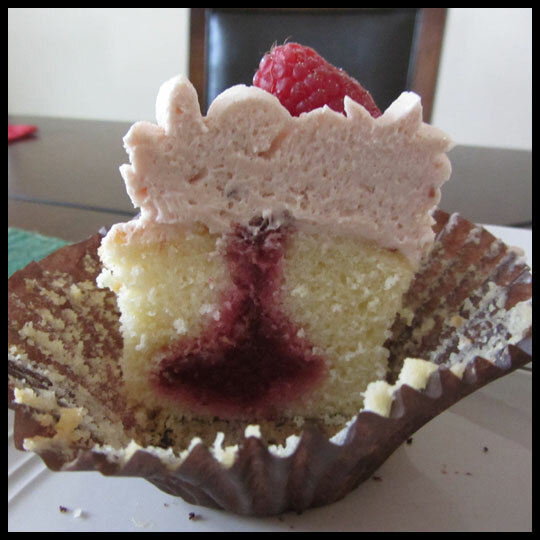 Normally, I’m not a fan of strawberry frostings, but this cupcake was AMAZING. It was definitely my favorite of the bunch. On its own, the frosting was really sweet, but with the mild vanilla cake and the tart raspberry filling, it all worked so well together. The filling was the biggest surprise. The way it was so evenly distributed in the cupcake was really nice. It ensured that with every bite you got the raspberry and strawberry flavors mixed together. 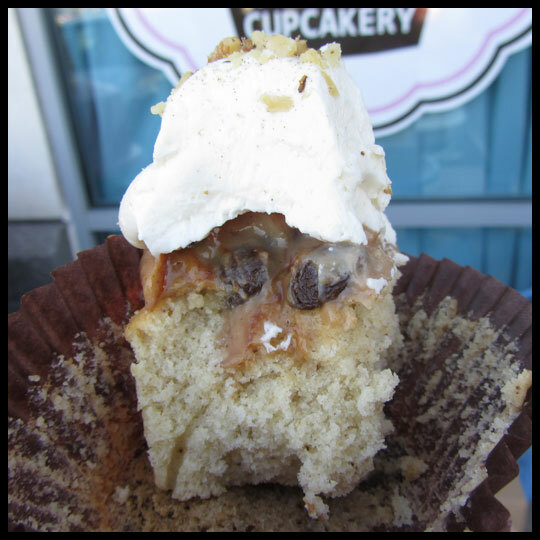 I would drive the half hour to have another bite of this cupcake. It was so good! 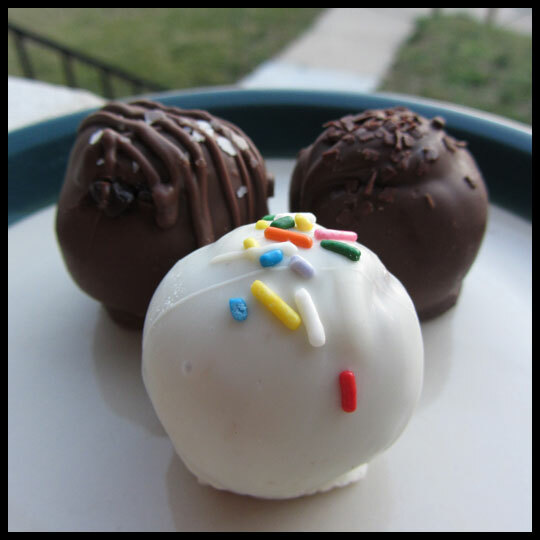 As I mentioned above, I also got some cake truffles for “game night” at my house. They had three flavors in the shop, Salted Caramel, Chocolate Funfetti, and Double Chocolate, so I requested a mixture of them. The first I tried, before everyone arrived, was the Salted Caramel. Like the cupcake, it was a great blend of salty and sweet. Later that night I sampled the Chocolate Funfetti which was dipped in white chocolate. This little cake truffle was packed with rich chocolatey sweetness. After just one, a tall glass of milk would have been wonderful. I didn’t try the Double Chocolate until the next day and strangely, something seemed “off” about it. We aren’t sure what it was, but there were three of us tasting it and we all couldn’t quite place it. Overall, I was really happy with my Flavor experience. There may have been some things that weren’t my favorite, but the treats that were good, were really good. I’m so happy that our Maryland cupcakeries are getting so much recognition on a show like Cupcake Wars. One day, I hope to visit all the Maryland locations that have competed. 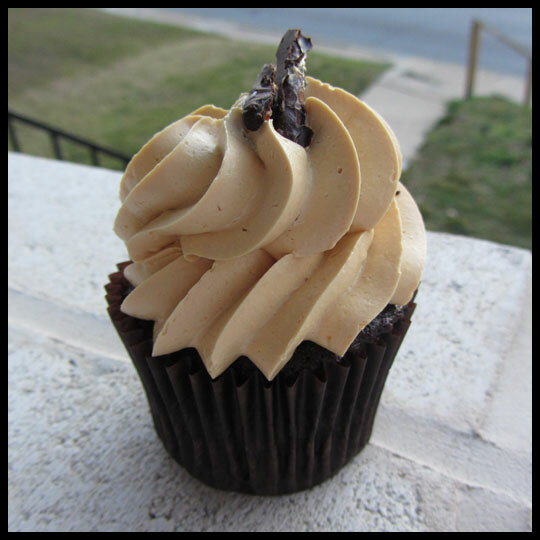 This entry was posted in Cupcake Wars, Cupcakes, Maryland and tagged Bel Air, Cake Pop, cake truffles, Chocolate, cinnamon, Cupcake Wars, Flavor Cupcakery, fruit cake, modern fruit cake, peanut butter, peanut butter chocolate, raspberry, S'mores, salted caramel, vanilla by Stacy. Bookmark the permalink.